An article for fire investigators and attorneys on the dangers and details of these appliances. In the commercial kitchens and restaurants, the deep fat fryer is one of the most susceptible appliances for serious fires. What is a Deep Fat Fryer? Illustration of how grease can accumulate in the flue gas exhaust of a typical deep fryer. A deep fat fryer (also called a fryolator, French fryer, or open vat fryer) is a vat, or multiple vats, filled with cooking oil that is heated by burners running through tubes underneath. The tubes may serve as a heat exchanger for a gas burner, or electric coils. Baskets of food are submerged in cooking oil heated from 163ºC to 191ºC (325ºF to 375ºF). What Causes Deep Fat Fryers to Ignite? Open fryers are particularly susceptible to poor mechanical maintenance. Normal cooking temperature for deep fryer vegetable oil is about 191ºC (375ºF). Thermostat malfunction is a primary cause for deep fryer fires in restaurants. If a thermostat malfunctions, cooking temperatures can rise. At 218ºC (424ºF) oil starts to smoke. Smoke production will increase as the temperature rises. Auto ignition takes place at approximately 273º to 420ºC (523º to 788ºF),depending on the type of oil, the amount of impurities in it and usage. New “high-temperature” fryers are designed to maintain the heat of the oil longer and cook at higher temperatures (much closer to auto-ignition), making these units a more significant fire risk. Appliance manufacturers should be involved in notifying end-users that new “high-temp” fryers require upgraded fire-extinguishing systems. In nearly all fryer designs, the flue gas exhaust vent for the heat from the burner elements (whether gas or electric) goes up the back of the unit behind the vat. With repeated splashing a substantial coating of grease can build up and harden on top of and around this exhaust stack (like creosote in a wood burning chimney). This residue provides an excellent fuel source especially if some of the buildup falls close to the burner elements below. 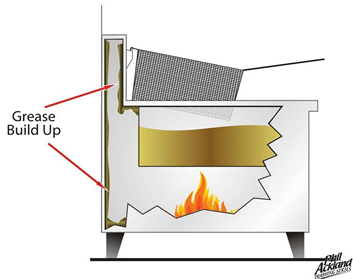 Most new fryers are constructed with the chimney open at the bottom, so any debris that falls down the gas flue chimney should fall straight to the floor. NFPA 96 requires a clearance of at least 406 mm (16 in.) between fryers and any open flame burners. A 203 mm (8 in.) metal or tempered glass panel can be used to achieve this clearance. If this clearance is not met, open flames can ignite the cooking oil. There must be a 16” gap between the fryer and any open flame. This can be achieved with a spacer (8”and 8”). What to do if Your Case Involves a Deep Fat Fryer Fire? Thermostatic controls and electronic ignitors are sophisticated components ensure that your subject expert has a solid understanding of the workings of the deep fryer involved. If the deep fryer was the original source of the fire (point of ignition), the appliance should be saved, examined, and tested in a professional lab. Onsite probing or disassembly of the controls should be avoided. A laboratory examination of the fryer can reveal that the safety devices have been tampered with, there has been an overheating of an empty vat causing metal fatigue, and/or improper or inadequate maintenance of the unit has recently taken place. See additional articles on philackland.com.